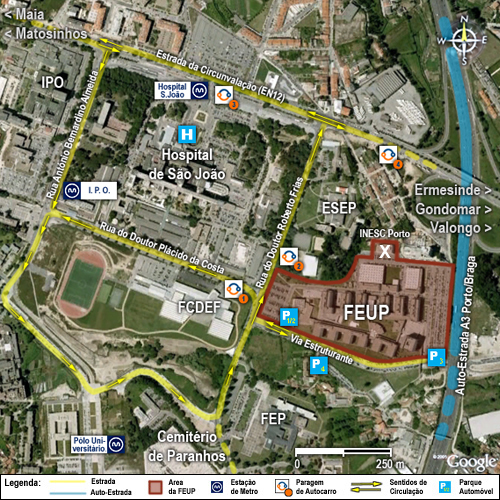 By car: From the airport head towards the A41, take the A3 towards Porto, exit towards "Hospital de São João". By bus: Several bus lines go to FEUP / Inesc: 301, 204, 205, 505, 507, 603, 604, 704, 705, 706, 803, 804, 805. By metro: The closest metro station is IPO, direction Hospital de S. João (Line D, yellow). After getting out follow Rua do Dr. Plácido da Costa and cross to Dr. Roberto Frias. You'll be in front of FEUP.